"One day I will overthrow these low-grade knock-offs and rule the Predacons with two iron fists!" Terrorsaur flies through the skies a silent warrior. Using a bright crimson fuselage as his camouflage, Terrorsaur likes to attack with the sun at his back as he descends upon Autobots and Maximals alike with reckless abandon. One of Megatron's most skilled fliers, Terrorsaur has secret ambitions to rule the Predacon army and stays by Megatron's side only as a means to an end. He has studied military history, particularly that of Decepticon lieutenants and their usual deceitful ways of advancement through the ranks. 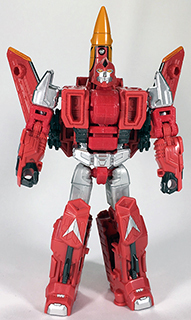 Remolds: This figure was remolded from Combiner Wars Skydive (2015), Combiner Wars Air Raid (2015), Combiner Wars Generation 2 Skydive (2016), Combiner Wars Generation 2 Air Raid (2016), and Botcon 2016 Cicadacon (2016), and was later molded into Unite Warriors Ghost Starscream (2016, Japan), Unite Warriors Curse Thrust (2016, Japan), Combiner Wars Strafe (2016), Combiner Wars Fellbat (2016), and Combiner Wars Guyhawk (2016). 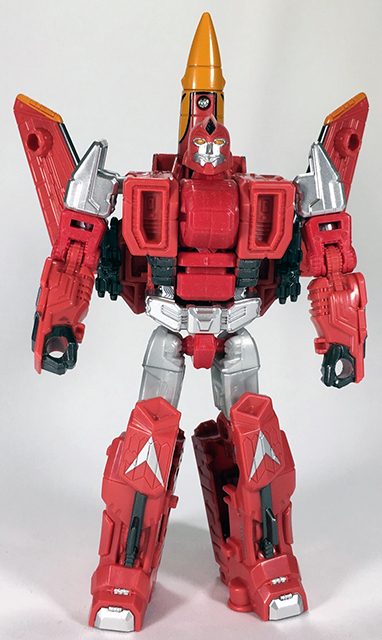 Name Reuses: The name Terrorsaur was reassigned to Armada Terrorsaur (2003) and Classics Terrorsaur (2006).